Snooper AVN S7000 Syrius in-dash motorised 7-inch wide touchscreen LCD, satellite navigation, AM/FM receiver, DVD/CD player plus Bluetooth and iPod connectivity. The Snooper S7000 Syrius is preloaded with NAVTEQ mapping for UK, Eastern and Western Europe. It is also possible to add a reversing/parking camera. Snooper AVN S7000 Syrius has been discontinued. Snooper AVN S7000 Syrius in-dash satellite navigation system with single din includes the latest NAVTEQ maps for countries in both Eastern and Western Europe, including UK, Ireland, France, Germany, Spain and Italy. The Snooper AVN S7000 Syrius Europe features a super bright 7-inch colour widescreen touch screen LCD display with turn by turn navigation, voice guided instructions and a full 8-digit UK postcode searches with a choice of 2D or 3D moving map display. Snooper AVN S7000 Syrius Europe in addition features the AURA speed camera database which is updated on a daily basis. The Snooper AVN S7000 Syrius Europe also includes multi-route planning and Bluetooth handsfree technology. Snooper AVN S7000 Syrius Europe with AURA speed camera database offers European protection. Included in the Snooper S2000N Syrius Proline are locations in Germany, Holland, Belgium, France, Spain, Portugal, Switzerland, Ireland, Italy, Austria, Luxembourg, Denmark, Norway, Sweden, Finland, Poland, Romania and United Kingdom. The Snooper AVN S7000 Syrius Europe is integrated with Bluetooth technology for handsfree calling with compatible mobile phones. Also available as an optional extra is an extension microphone perfect for vehicles which generate a lot of background noise. The Syrius AVN S7000 is also the first installed single din head unit that is updateable. The S7000 Syrius Europe SD card can be removed from the device and easily updated via your PC. To ensure that you always get up to the minute speed trap information it is essential that you download the latest version of Snooper's AURA speed camera database regularly. Syrius Europe AVN S7000 is the only device on the market that offers this unique functionality. In contrast, Snooper has assembled a professional team that devotes every working day to verifying each and every speed camera and high risk zone that goes into the AURA database. Included in the Snooper AVN S7000 Syrius Europe are speed camera locations in Germany, Holland, Belgium, France, Spain, Portugal, Switzerland, Ireland, Italy, Austria, Luxembourg, Denmark, Norway, Sweden, Finland, Poland, Romania and United Kingdom. The AURA speed camera database incorporates shared mobile Police positions, Gatso cameras, Truvelo cameras, SPECS cameras, DS2, Speedcurb, Watchman, Multi Lens Gatso, Accident Blackspots, Mobile Laser Sites and High Risk Zones. Plus the AURA database includes the speed limits at all these locations so your Snooper AVN S7000 Syrius Europe can count down accurately to the hazard! 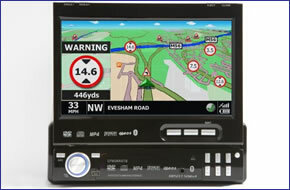 Snooper AVN S7000 Syrius Europe is on a single din head unit incorporating a built-in motorised 7-inch touch LCD display. Snooper AVN S7000 Syrius Europe works with NAVTEQ maps to provide detailed street level maps of Western and Eastern European countries. Recognised as the industry leader in digital street level mapping, NAVTEQ maps provide high quality, detail rich maps. Ensuring you are taken seamlessly from A to B on the best possible route with full UK 7-digit postcode search. To ensure the most accurate postcode search available Snooper Ventura uses Ordnance Survey, the most comprehensive of it's kind. To view map coverage simply click on the third image above within Snooper AVN S7000 Syrius Europe images. The following countries are pre-installed on the Snooper AVN S7000 Syrius Europe: Andorra, Austria, Belgium, Czech Republic, Estonia, Denmark, Finland, France, Germany, Gibraltar, Hungary, Ireland, Italy, Latvia, Liechtenstein, Lithuania, Luxembourg, Monaco, Netherlands, Norway, Poland, Portugal, Romania, San Marino, Slovakia, Slovenia, Spain, Sweden, Switzerland, United Kingdom and Vatican City. Snooper AVN S7000 Syrius provides advanced warning of all fixed speed cameras, SPECS and many laser sites using Snooper's AURA speed trap database. There are 3 easy ways to pay using a credit or debit card. To download and successfully update the Snooper AVN S7000 Syrius with software, sat nav map updates and/or speed camera locations via a computer you will need a PC running either Windows XP (32-Bit), Windows Vista (32-Bit), Windows Vista (64-Bit), Windows 7 (32-Bit), Windows 7 (64-Bit) or Windows 8 (64-Bit) with an internet connection. Please note: the AVN S7000, as with all Snooper products, is not Apple MAC compatible. Do you have a question about the Snooper AVN S7000 Syrius? Submit your question via our contact page.